Blaufränkisch happens to be one of Austria’s flagship red varieties, with over 322,000 acres planted. Here at Shady Lane Cellars, we have a modest 3-acre plot of Blaufränkisch, otherwise known as Lemberger in Germany, and although our plot may be small, it produces wine with big personality. 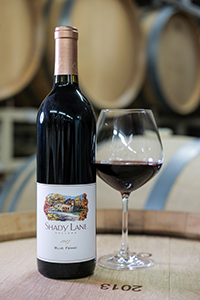 The Shady Lane Cellars Blaufränkisch is a dark red wine with layers of blueberry, blackberry, and mulberry fruit. A hint of black pepper and cedar spice finish this wine with aged, lush tannins and big mouthfeel.